What is the best way to get all the divisors of a number? UPDATE 2: Stop saying this is a duplicate of this post. 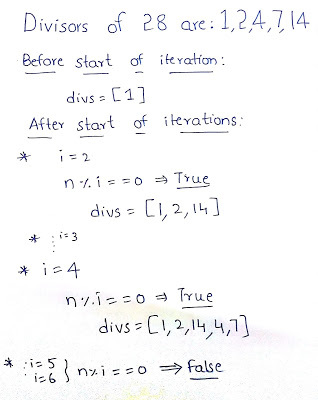 Calculating the number of divisor of a given number doesn't need to calculate all the divisors. It's a different problem, if you think it's not then look for "Divisor function" on wikipedia. Read the questions and the answer before posting, if you do not understand what is the topic just don't add not useful and already given answers. The overall efficiency of this algorithm will depend entirely on the efficiency of the factorGenerator. To expand on what Shimi has said, you should only be running your loop from 1 to the square root of n. Then to find the pair, do n / i, and this will cover the whole problem space. As was also noted, this is a NP, or 'difficult' problem. Exhaustive search, the way you are doing it, is about as good as it gets for guaranteed answers. This fact is used by encryption algorithms and the like to help secure them. If someone were to solve this problem, most if not all of our current 'secure' communication would be rendered insecure. I think you can stop at math.sqrt(n) instead of n/2. I will give you example so that you can understand it easily. Now the sqrt(28) is 5.29 so ceil(5.29) will be 6. So I if I will stop at 6 then I will can get all the divisors. How? So at the end of all the iterations as I have added the quotient and the divisor to my list all the divisors of 28 are populated. Hope this helps. If you have any doubt don't hesitate to ping back and I will be glad to help you :). I like Greg solution, but I wish it was more python like. I feel it would be faster and more readable; so after some time of coding I came out with this. The first two functions are needed to make the cartesian product of lists. And can be reused whnever this problem arises. By the way, I had to program this myself, if anyone knows of a standard solution for this problem, please feel free to contact me. "Factorgenerator" now returns a dictionary. And then the dictionary is fed into "divisors", who uses it to generate first a list of lists, where each list is the list of the factors of the form p^n with p prime. Then we make the cartesian product of those lists, and we finally use Greg' solution to generate the divisor. We sort them, and return them. I tested it and it seem to be a bit faster than the previous version. I tested it as part of a bigger program, so I can't really say how much is it faster though. P.S. it is the first time I am posting to stackoverflow. I am looking forward for any feedback. Adapted from CodeReview, here is a variant which works with num=1 ! NOTE: For languages that support, this could be tail recursive.
""" Returns  a list of primes < n for n > 2 """
""" Returns a list of the prime factorization of n """
""" Returns an unsorted list of the divisors of n """
I'm just going to add a slightly revised version of Anivarth's (as I believe it's the most pythonic) for future reference. Here's my solution. It seems to be dumb but works well...and I was trying to find all proper divisors so the loop started from i = 2. If you only care about using list comprehensions and nothing else matters to you! Not the answer you're looking for? Browse other questions tagged python algorithm math or ask your own question. How to find the prime factors of a number in Python? Is there a simple algorithm that can determine if X is prime, and not confuse a mere mortal programmer? What is the easiest way to get a list of whole factor pairs of a given integer? How to count the number of reduced proper fractions fast enough? Finding the total divisors of a number up to 10^12 as fast as possible? What is the best project structure for a Python application? What is the best algorithm for an overridden System.Object.GetHashCode? What is the quickest way to HTTP GET in Python? How many numbers below N are coprimes to N? Best way to convert string to bytes in Python 3?